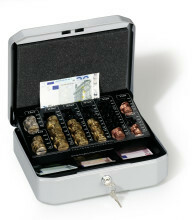 Metal cash box with tray subdivided into 4 coin and 2 banknote compartments, one multi-purpose compartment and pen and paper clip sections. Complete with ticket dispenser slot. Weight: approx. 1.4 kg.